This is another one of those testimonies that will knock your socks off! 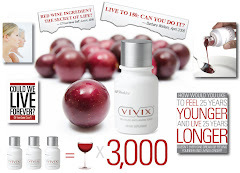 Resveratrol Anti-Aging Tonic Vivix hasn't been tested on children, so Shaklee has a caution statement on the box saying not intended for children or lactating women. I bet the parents of this child will be forever greatful for the day they were introduced to premium natural products Shaklee has taken from nature, tested and provided. our friends daughter (7 years old) that has the cancerous brain tumor. To refresh your memory - she was diagnosed a year ago this week with a very progressive tumor - not much hope for her at all (maybe 3 years max). prayers And Shaklee have made a difference. They put her on Nutriferon and I believe the kids vitamins. She continued to hold her own and did pretty good. We called them from New Orleans and told them about Vivix and they ordered some right away. What did they have to lose. She has been taking Vivix since August and the tumor has shrunk during the last three visits to Mayo. Their last visit was sooo amazing! The doctor said they can hardly detect it now!!!!! She no longer has to do chemo and the doctors said to "keep doing, what you're doing" because chemo does not do this to this kind of tumor. When I saw this testimony I felt a sense of urgency to share it with you..
One hundred years from now it will not matter what kind of car I drove what kind of house I lived in, how much I had in my bank account nor what my clothes looked like. But the world may be a little better because I was important in the life of a child.